In your Facebook Business Manager account, you can segment your product catalog by creating product sets according to one or several common criteria. This allows you to better control which products will appear in your ads. To know more about product sets click here. So, thanks to these custom labels, your Facebook campaigns can be used more wisely to better promote your products on the social network. For example, products belonging to the "Summer products" set are not, in general, distributed during winter. Custom label 0 : "Summer time"
Custom label 1 : "Best sellers"
Custom label 2 : "Price under $5"
Custom label 3 : "High margin"
Custom label 4 : "New products"
Facebook allows you to assign up to 5 custom labels, numbered 0 through 4, to each product. 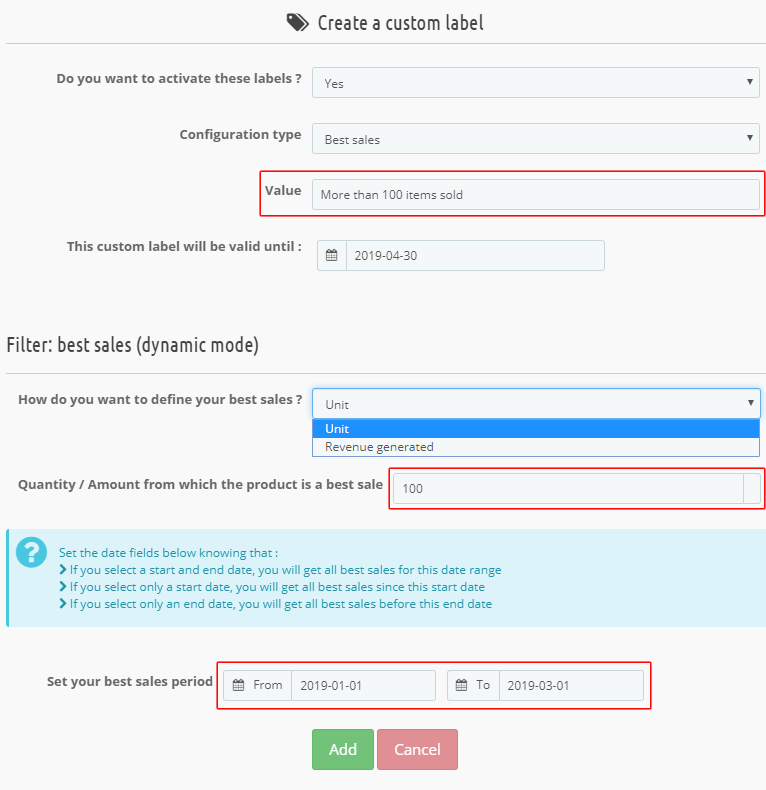 So, although our module allows you to potentially create as many custom labels as you want, if one of your products has more than 5 custom labels, our module will select only the first 5 ones. Remember that you are the only one who sees these labels and that they are only intended to help you as a merchant in managing your catalog on your Facebook Business Manager interface. They don't appear in your Facebook ads. From the version 1.3.0 of the module, you can create advanced custom labels (if you have a lower version of the module, visit this documentation instead). 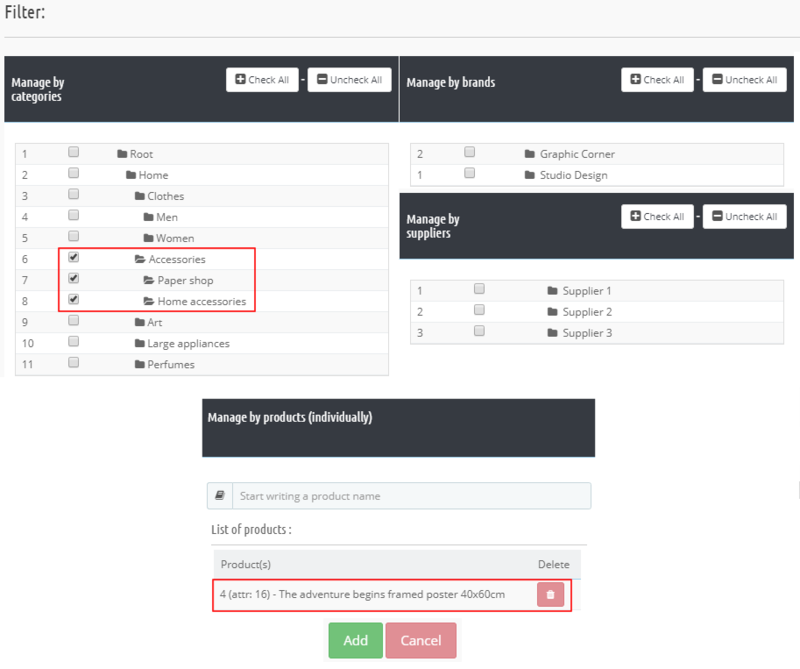 Choose a manual (basic) configuration to have a maximum freedom in assigning labels. With it, you can write the label's name and then select the category(ies) or brand(s) or supplier(s) of the products you want to assign this label. You can also select one by one some products, by starting to type their names. In this example, a custom label "High Margin" has been created to identify the products with the highest margin. The configuration is "manual" and the custom label will be active until August 31, 2019. The (default) categories "Accessories", "Paper shop" and "Home accessories" have been selected to assign this label to the products associated with them. The "40x60cm" combination of the product "The adventure begins framed poster" was also individually selected. A lign matches with a custom labels set. A green font means that they are activated, this means that each time your catalog is automatically updated in the Facebook Business Manager, they will be included in the feed. A red one means that they aren't (as for example the "Valentine's day" labels above). To add a custom labels set, click on the "+" button on the top right of the table. When the set has been created manually, all the custom labels bear the same name ("High margin" in the case of our example). We will see that for "dynamic mode" configurations, it will not be the case because the label values will be dynamically retreived. You can drag and drop the lines to sort the custom labels sets, thanks to the little cross at the left of each line. The dynamic mode means that label values are dynamically retreived, that is to say, the module takes care of retreiving them by itself. If you choose "Categories" or "features", you will not need to write the label's name because it will automatically be retreived : it will match the default category's name or the product feature value. 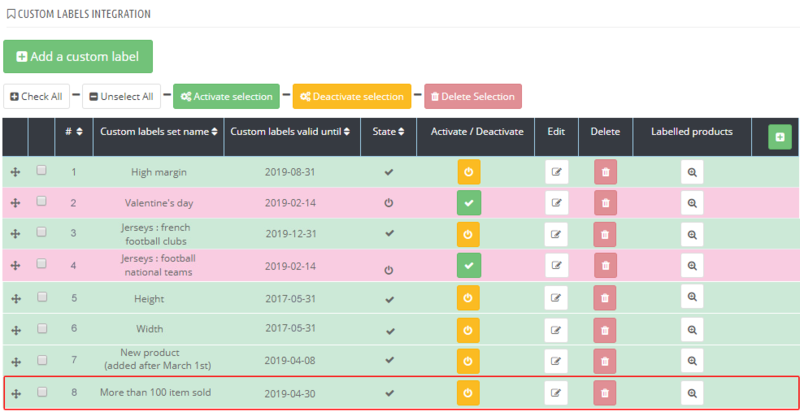 With this type of configuration, you can assign labels to certain products with the name of their main category (default category). 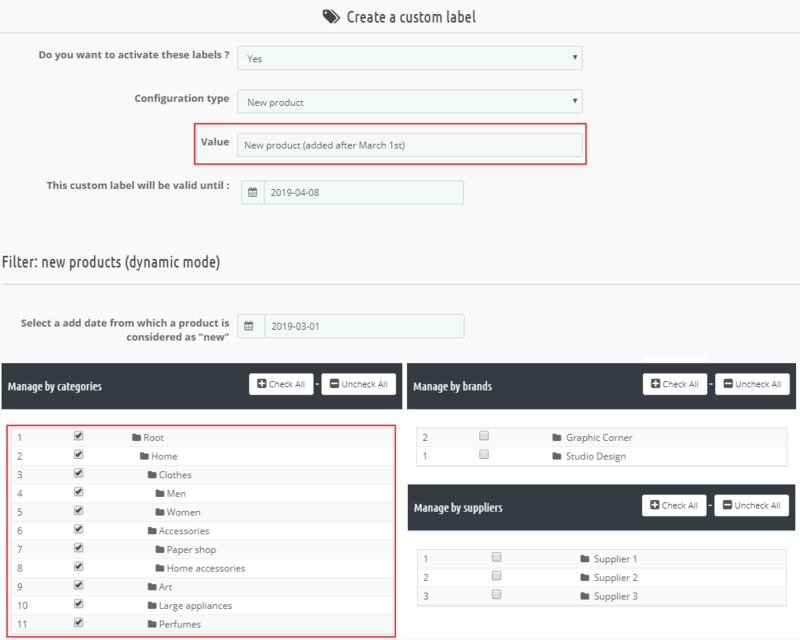 Labels values are assigned dynamically since the module will automatically enter the name of the product parent category on the label. The "Value" field corresponds here to the title that you want to give to the set of labels you are creating. You can enter the title you want since it's a free field. This title will serve you to find this set among others in the list of custom labels sets. In this example, we have decided to assign custom labels to french football clubs jerseys, in order to indicate which club they belong. This could be usefull to create Facebook campaigns based only on a single club (PSG for example). We have called this football clubs labels set : "Jerseys: french football clubs". We have selected the "PSG", "OM", "OL", "OGC Nice" and "AS Monaco" categories. So, products of the "PSG" category will have a custom label "PSG", those of the "OM" category will have a "OM" one, and so on. These labels will be valid until the date : 2019/12/31. Thanks to these labels, we can subdivide the products and create Facebook campaigns more targeted. In the same way, we could create a labels set called "Jerseys: football national teams" in order to assign, to each national team jersey, the name of the country they represent. In this way, we could create facebook campaigns only based on France team jerseys for example. 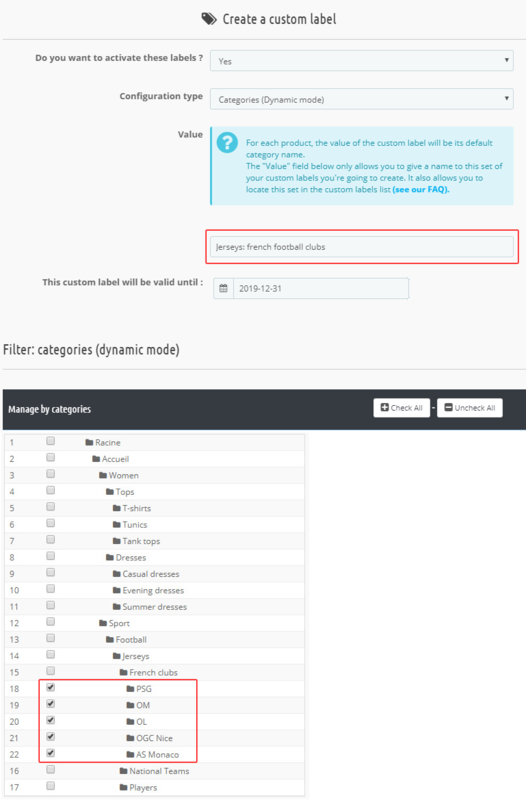 The separate creation of the "Jerseys: french football clubs" and "Jerseys: football national teams" labels sets allows to manage them independently (activation/deactivation, expiration date, etc...). Note : You can drag and drop the lines to sort the custom labels sets, thanks to the little cross at the left of each line. 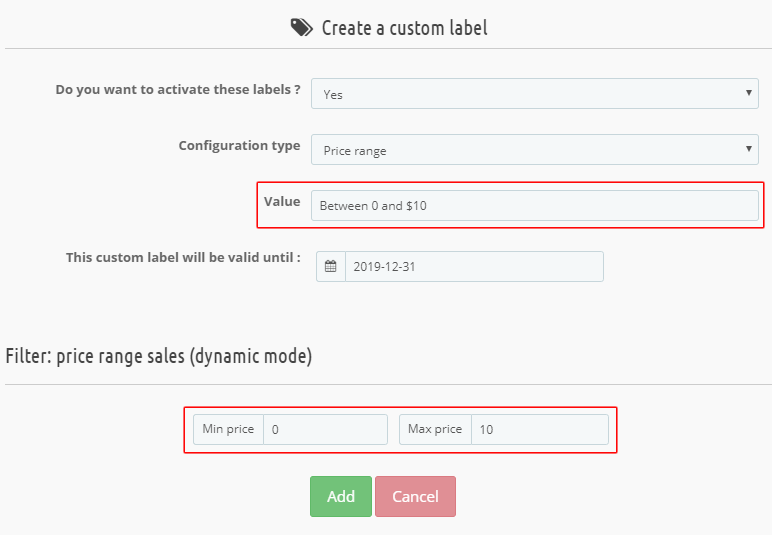 With this type of configuration, you can assign labels to some products with the value of a selected characteristic. 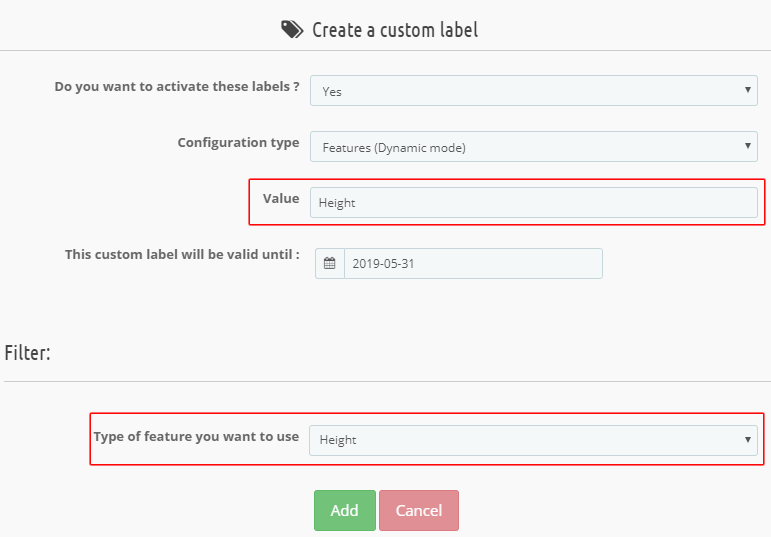 Labels values are assigned dynamically since the module will automatically enter the value (if any) of the characteristic assigned to the product on the label. The "Value" field corresponds here to the title that you want to give to the set of labels you are creating. You can enter the title you want since it's a free field. This can be for example the name of the selected characteristic. This title will serve you to find this set among others in the list of custom labels sets. In this example, all the products that have an information about their height will have a label indicating the value of this heigh, and this, until the date : 2019/05/31. Thus, if you have entered the values : "10 cm", "20 cm" and "30 cm" for example for the feature "Height", each product will have, according to its height, either the "10 cm", or the "20 cm" or the "30 cm" label. You will be able then to create Facebook campaigns based only on a specific height. In this example, you can see, just under the labels set about the height, that another custom labels set from another feature has been created: it's about the products width. In this type of configuration, you have to indicate the date from which you want that all the added products are considered as "New". The module will then assign a label to all products added to your shop after this date and that belong to the selected categories/brands/suppliers. You can decide of the title of the label in the "Value" field. It can be simply "New product" but you can write whatever you want since the field is free. 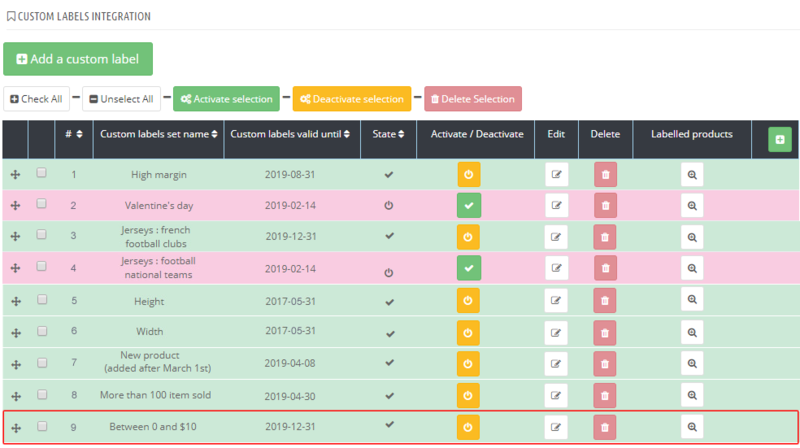 In this example, all the products (because all the categories have been checked) that have been added after the date 2019/03/01 will have a label "New product (added after March 1st)" and this, until the 2019/04/08. In this type of configuration, you have to specify the number items sold from which you consider a product is a "best sell". The module will then assign a label to all products that meet this requirement. You can define the title of the label in the "Value" field. It can be simply "Best Sellers" but you can write whatever you want since the field is free. You can, at your choice, define your best sales either in relation to the number of items of the same product sold, or in relation to the revenue generated by this product. In this example, all the products sold more than 100 times between the 2019/01/01 and the 2019/03/01, will have a label "More than 100 items sold" and this until the 2019/04/30. You could also have defined the best sales in relation to the revenue generated. In this configuration type, you can assign a label to products whose price (excluding tax) is within a price range to be specified. You define the title of the label in the "Value" field. You can indicate in this title the price range concerned or anything else, the field being free. In this example, all the products whose price is between 0 and $10 (tax exluded) will have a label "Between 0 and $10" and this until the 2019/12/31.